CLICK HERE FOR OUR SURFGUIDE! Surfing in Indo is known to most surfers in the world as the premier location to go for an affordable surf trip where you can experience amazing quality of waves, quantity of waves, friendly local people and a diverse number of different cultures to interact and surf with every day. Throw in cheap Accommodation, food and transportation and you have got possibly the most ideal surfing holiday you could imagine! With numerous break along all coastlines of Bali including Nusa Lembongan and Nusa Dua it is hard not to find the ideal wave you have been looking for. There are also many places you can stay for cheap which will give you a roof over your head, your food and surf guiding by either a local balinese surfer or overseas frothers that have moved and now live in Bali chasing these waves everyday! You could always go for something a little more upper class and Bali has no shortage of beautiful cost affective resorts around Kuta, and Seminyak, not to mention up the coast a bit further towards Uluwatu, Bingin and Padang Padang. Food is also another dynamic part of Bali, with many Asian dishes coming out of numerous restaurants, cafes and Bars around town. Like the shopping, the food is extremely cheap and you can get a 3 course dinner for less than $10! Insanity! Line Up Surf recommend staying at Padang Padang Surf Camp which offer many options to suit your accommodation budget. 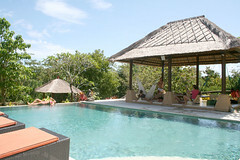 With Villas that sleep up to 8 people, Breakfast and Lunch prepared for you each day and daily transfers to the breaks. Padang Padang Surf Camp also offer a Surf School service for people who want to take up surfing. This is included in your package and you can go as often as you want. Of course there a set of guidelines you must follow and you must understand that if the waves are too big to learn in the instructor will advise against taking you out on your lesson. Beside Surfing Padang Padang Surf Camp offer Snorkeling and tours around Bali which are popular with guests. 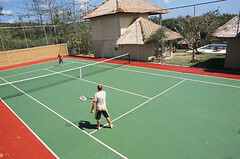 It features a tennis court and beautiful heated pool. The Villas also surround the Pool and chillout area, so more often than not surfers find themselves talking to other guests they have never met and build good friendly relationships with each other. Another facite that makes the surf camp so popular. Padang Padang Surf Guides will take you surfing everyday from the camp by either walking to the nearby breaks or taking their van and drive to breaks further up the coast like Uluwatu or down the coast like Balangan and Nyang Nyang. If the waves are too big Kuta Reef or Airport Rights and Lefts is an option too. If the waves are too small, the guides will either try find some waves around Bali. However this rarely happens as Bali is one of the biggest swell magnets on the planet and hardly ever gets unrideable due to small waves. Includes - Breakfast, Lunch, Surf Guide, Airport Transfers. - Package Options 1,2,3 include Airport Transfers for guests staying 1 week only. *Airport Transfers cost $50 return if less then 1 week stay.